﻿﻿Bruce is a co-founder of One for Health Foundation with his life long friend, Tom Miller. 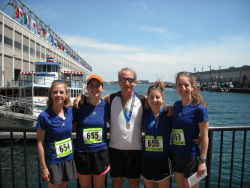 Bruce volunteered to run in this year’s Boston Marathon for OFH to raise funds for its programs supporting healthy lifestyles. Bruce is passionate about his commitment to change the health of America by providing kids with the tools to create a path to lifelong wellness. ﻿having run programs in several Boston area towns, and now teaming with the Watertown Police Foundation and the Watertown Boys & Girls Club to deliver programs for kids in Watertown.﻿ Bruce would like to see his and Armando's efforts in this year's Boston Marathon help launch larger rounds of funding and expand the reach of OFH's programs. "I'm happy that Armando has joined us. 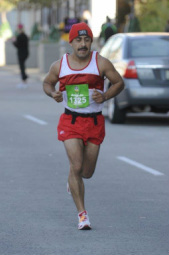 He has an amazing story and is a great runner. I look forward to greeting him at the finish...if he can wait that long." Bruce holds a bachelor’s degree in electrical engineering, an MBA, and a PhD in Natural Health. He is a USA Masters Track & Field Atlantic Region two-time gold medalist. At age 55 he was invited (one of 8 in his age group) to run the 100 meter dash at the Penn Relays, a premiere track event. 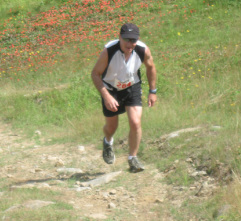 And at age 56 he ran in the USA Masters Track & Field Indoor National Championships in Boston. Bruce brings forward an unusual and outstanding complement of experience and skills to support his goal of helping others, especially children, attain the highest level of health and joy in their lives. Armando credits his great physical shape with saving his life, and is now running even better than before his heart attack. 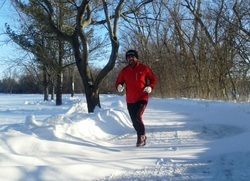 His perseverance and positive attitude gave him the motivation to train again and he is proud to be running for OFH in this year’s Boston Marathon. Armando was born in CD Juarez Chihuahua, Mexico on November 17, 1965. In 1980, his family moved to the United States. He went to West High School in Rockford, IL and ran Cross-Country all of his school years. He ran his first Marathon in 1983, winning in his age group of 19 and under with the time of 2:47:13. He moved to Kansas City, MO in the summer of 1984. Married Renee Lozano and they have four (4) children: Aurora, Chelcie, Stephanie and the only son, AJ.